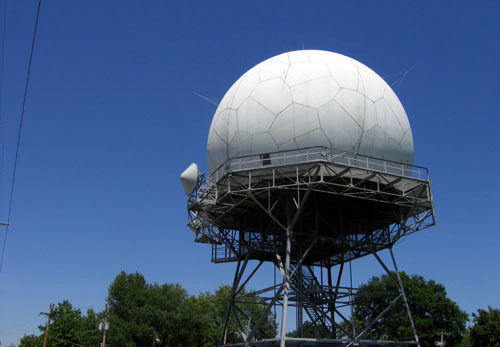 It’s known by many names: The Giant Soccer Ball, The Big Golf Ball, The Orb, The Big Boo! It belongs to the airport, helps planes land safely. It scrambles radio reception as you drive by. Guess what it does to TV reception for the folks living up against it. Imagine living up against it, constantly hovering over you, reflected in your morning cup of coffee or as a reflector for sunbathing on the back patio. There is none more modern, more high tech or Big Brother, The Big Boo! 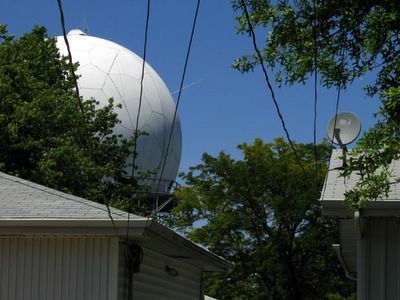 This entry was posted in north st. louis county and tagged airport orb, golf ball on midland, overland missouri by Toby Weiss. Bookmark the permalink.